To advance my comment above most cities that are cited as planning exemplars have more community say then Melbourne does on strategic planning issues (eg. Overall heritage issues, precinct structure plans, etc) but less community opportunity to comment on individual applications. the community can trust that their input to the strategic stage and the agreed planning scheme will be what is approved through a more prescriptive planning scheme. Our performance based schemes mean developers constantly push the boundaries and often get what they want (eg. Windsor decision which led to palce theatre/w hotel situation, by upgrading developer expectations for the Bourke hill precinct). The Baltic Import buildings date to a time in Melbourne's development which is now poorly represented in the CBD (the 19th century gold Rush) - that is relevant information in identifying the heritage significance of this property. Total House likewise has been extremely well documented as to the important architectural and cultural contribution it makes to Melbourne - it is a rare and important building. You can read the ruling by the Heritage Council if you need more information in front of you 'to make an informed decision' about it. The Age building was not a brutalist building, as far as I understand the term, and was of little architectural significance in comparison with Total House. These issues are not at all as subjective as you make them out to be, Dean. And lastly, if developers can't make money out of these important sites without wrecking them, then they shouldn't purchase them. The problem is with our weak planning regime - make it clearer (as Adam suggests) to developers that there are strong rules around heritage and these sites will no longer be targets if they are considered unviable for a particular kind of development. I was specifically trying to start a debate about the system. At present, as John says, you could apply to demolish Flinders St station. You would have no chance these days, but Hamer credibly wanted to do that just 40 years ago. Yet the national trust can whinge about something as abstract as "the view of St Paul's from the middle of Princes Bridge and thus screw up Federation Square. Heritage is a complete dice roll right now, which is why the Palace owners keep gambling. We have a heritage A,B,C scheme (albeit incompletely surveyed). That could easily be transitioned to formal "A cannot be significantly altered, B can be altered with consideration to x, C with consideration to y", survey at least the whole CBd, add anywhere else already surveyed and if the trial works, apply it to all the inner suburbs. Wholesale certainty once properly established, particularly if you created a kind of " heritage rescode" that sat alongside your gradings which clearly set out what the good development principles are. Dean, you should probably Google "brutalism". It's a defined architectural style, not a translation for "monstrous gobshite", which is where the Age buildings can now thankfully historically be filed. And second guessing the obvious criticism of my scheme you would still have significant argy bargy over how buildings are then graded, but that should all happen only once at the scheme's inception, then certainty prevails. I don't think greater community involvement beyond that stage is actually the answer. We need one definitive, rather than many subjective voices, I reckon. It appears one of the buildings was a Bank of NSW from at 1875 onwards. The property comprises 2 extant buildings that are listed on the Heritage Inventory, a list of potential archaeological sites. 1. relates to the original settlement of Melbourne, and the construction of John Batman's dwelling in 1837. The study area was either part of a larger garden area, or was a vacant block. 2. relates to the site's use as part of Langlands Foundry, which dates to 1842. 3. relates to the occupation of the site in 1866 by George Stooke, who constructed the buildings that stand at 558-460 Flinders St today. 4. relates to 1875 and the construction of the Bank of NSW at 556 Flinders St.
5. The final phase involved renovations to all 3 buildings in the early 20th century. So, in summary, this site is one of the most historic links with the very earliest period of European settlement in the district. 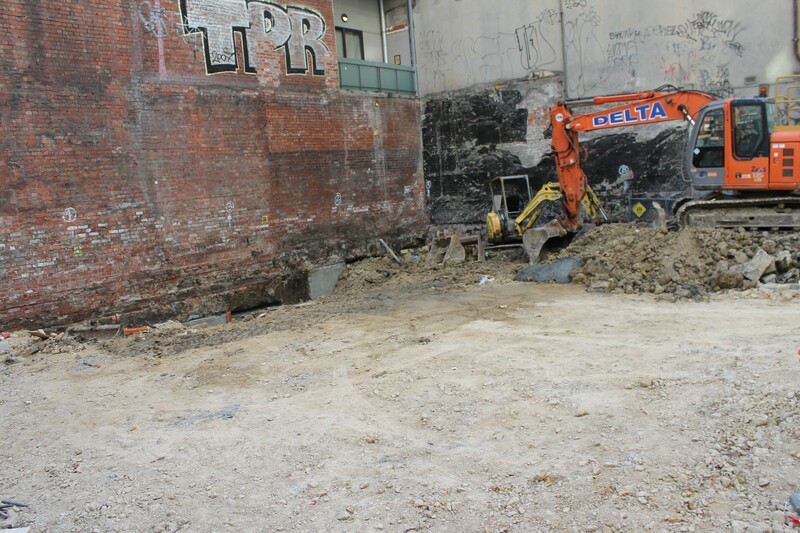 It was part of John Batman's garden, and the existing buildings date to 1866, making them some of Melbourne's earliest remaining Victorian shops from the gold rush era. What's the bet we're not getting the suggested archaeological survey with the development? Too late to contact the developer, I suppose? Assuming Council approved this, it would be criminal if they didn't insist on it. By which I mean a proper excavation, to be clear. But they should really be on site now, if so. Definitely agree with your approach Adam. In some respects it just happened with the city of melbourne though (at a lower scale than you propose) and the minister for planning didn't accept the findings for any of the roughly 10 post war buildings, so even when a good objective study is completed with consultation the opinion of one man leads to perverse outcomes. Yes private buildings are on the VHR, Total House being a recent addition for instance. Just think, all that lovely graffiti will be covered up........not! Another piece of old Melbourne lost forever - or another way of looking at it, a community asset destroyed for the sake of private interests. If we extend the logic here, there's no reason why we shouldn't accommodate more population growth in the CBD by building over the Yarra. What's a bit of shared cultural heritage worth anyway? Except the Yarra is a natural asset that can't be bought. 560 is an inanimate man made structure that has been exchanged for sums of money over a period of time. Natural assets can absolutely be bought, sold and traded in various ways - take Royal Park as the classic example of this, and recent attempts to utilise the park for the development of an expressway. The thing that 150 year old heritage places and the Yarra have in common is their civic value to the state and its citizens. This is why private property is not entirely unregulated in Victoria. There are restrictions on how each lot can be developed in order to take into account both private and public interests - heritage is one of those public interests (that is, an aspect of (private) property that has a public / civic function). 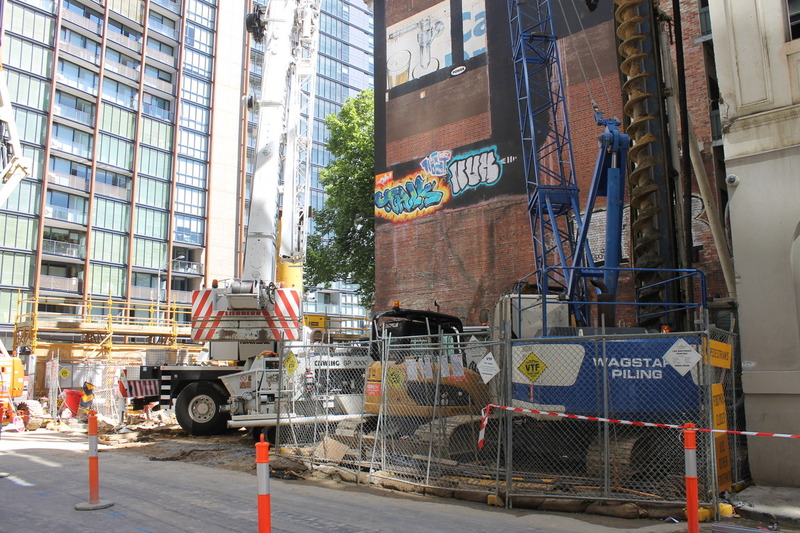 In this case, a building which was invested with significance to the citizens of Melbourne beyond its value as a land site was allowed to be divested of its heritage significance for the benefit of private interests. This is not against the law. It is, however, a blow to citizens' shared interests in this property as a site of cultural heritage. Now that interest is gone and we move on ... a poorer city for it. Use imgur.com. It has the best bandwidth out of all the photo uploading sites.